Authorities in the Eastern Asian country of Malaysia have found and busted an illegal online operation, which sent text messages to potential players to try and get them to sign up. It was reported on Wednesday by the Sun Daily, that police had proceeded to arrest five individuals in Kuala Lumpur, the capital city of Malaysia. The authorities claim that the illegal online casino was bringing in profits of around 3.3 million ringgits per month – about £604,000. This all came after a member of the public tipped the police off about such events. Local media were updated by a police chief in Kuala Lumpur, Commissioner Datuk Seri Mazlan Lazim, over the happenings. He said that the operators of the illegal gambling ring sent masses of texts to random numbers in China and Malaysia, promoting an online casino. He went on to state that the operation has been active for around one year, working from an apartment in the capital city, which served as the ring’s “customer support department”. Once customers received the text message, if they chose to respond to it, then the “customer support team” would direct them towards opening an account at the casino and proceeding with a deposit. Police went on to investigate the computers and the mobile phones that they seized while the raid was taking place. The information on these devices showed that the gambling ring had brought in more than 20,000 “players”. Reports suggest that deposits of more than 120,000 ringgits (£21,950) per month were coming from these clients. The gambling ring utilised Chinese bank accounts for accepting the deposits of these people, as well as for the pay-outs. The gambling itself was done through an unstated website, although the authorities are on the hunt for the operator of it at current. Not only that, but investigations remain under way to discover how the ring managed to get their hands on the phone data that was used to scam any potential customers. Malaysia, as a country, has never really had such a favourable attitude towards the online gambling industry. It has suffered somewhat with online gambling sites that choose to promote themselves through text message. 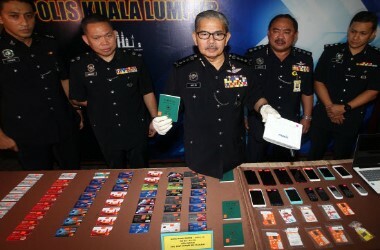 In fact, only a short couple of years ago, a purge of mobile phone numbers that were connected with illegal gambling operations and promotions was undertaken by the Malaysian Communications and Multimedia Commission (MCMC). As it happens though, this latest gambling ring and its illegal SMS messaging service only became apparent after boasts by the Malaysian government about the “successful” removal of illegal online gambling platforms. The phrase, “don’t celebrate too early”, seems to be appropriate in this instance.